Crude prices are $48.97 this morning, rising $.15 from Friday’s close. Friday saw prices stay relatively flat, gaining just $.30 (.62%) during the trading session. 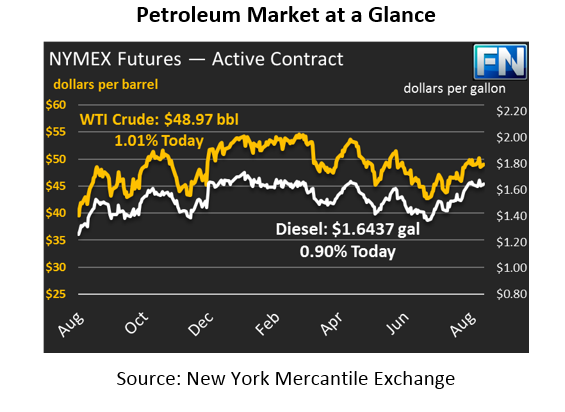 After Thursday’s IEA report caused crude prices to fall nearly $2, prices have been hovering in the $48-$49 range. Prices began this morning lower, but have since risen to just shy of $49. Refined products saw similar movement this week. Diesel prices are up nearly a penny since Friday, trading this morning at $1.6437. Diesel prices gained less than 40 points (.23%) on Friday, as weak volumes kept price movements low. Gasoline performed more strongly on Friday, gaining 1.6 cents (1.0%) to end the trading day at 1.6130. 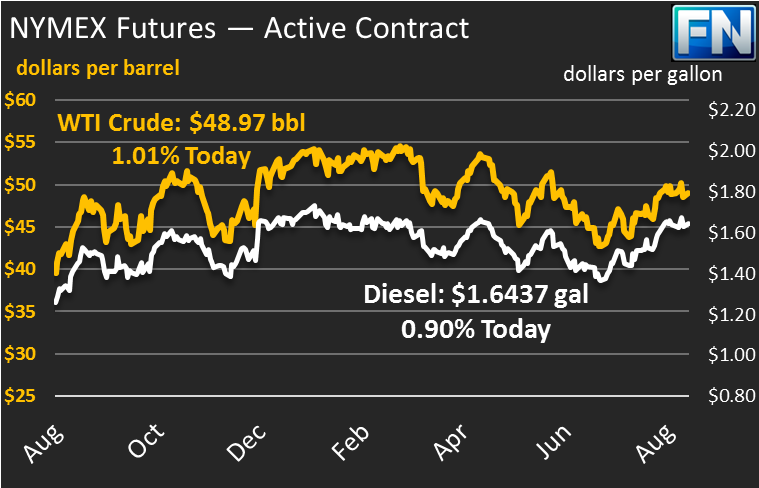 Prices are $1.6108 currently, down slightly from yesterday’s gains but overall maintaining higher gains than diesel and crude have. Markets appear to be in a holding pattern, waiting for a significant news event to move the market. The situation in North Korea seems stable for now, giving some confidence to traders that East Asia will cool down in the future. Baker Hughes released rig counts on Friday, revealing a net loss of 5 rigs in the U.S. during the week. This is the largest drop since January 2017, and before that the market hadn’t seen that many rigs lost since May 2016. Over the past five weeks, the net change in rig counts has been a loss of 3 rigs, demonstrating a significant slowdown in U.S. production growth. On the international production front, Nigeria and Libya (the two OPEC members not member to the OPEC/Non-OPEC cuts) have seen significantly output reductions over the weekend, with Libya losing 100 kbpd of production due to security concerns and Nigeria losing 200+ kbpd due to protests. After analysts have consistently cited these two countries as proof that the OPEC deal will fail, this instability is an important reminder that global production is just one major disruption away from being thrown into chaos and having prices soar higher once again.